An alumnus of Shri Ram College of Commerce, Delhi, Ankita Dabas is the Co-Founder & CEO of FabFurnish.com, India’s leading online home store. Ankita holds a Master’s Degree in Business Administration from University of Rochester, New York. She has a diverse decade long work experience in angel investing, private equity and investment banking with leading private equity fund, AIF Capital and investment banks including J P Morgan and Merrill Lynch. As a portfolio manager at AIF Capital, Ankita managed a multi-million dollar investment portfolio and gained valuable hands on experience in business development and strategic decision making for high growth firms. Prior to FabFurnish.com, she also co-founded two highly successful lifestyle-oriented ventures, Imperial Knots – a premium retail brand for Handmade Rugs and Carpets and Ikka Dukka – an eclectic designer boutique store. Her entrepreneurial stint and experience with AIF Capital has made her adept at working in high growth unstructured environments as well as stabilized established ventures. Given her diverse decade-old work experience and strong entrepreneurial acumen, Ankita has the necessary prowess to oversee all aspects related to creating and marketing consumer focused businesses. 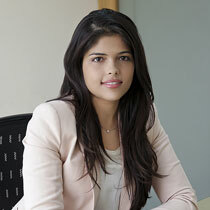 At FabFurnish.com, Ankita brings on-board her expertise in strategic business planning and execution and financial management with a vision to steer the brand into its next phase of growth and evolution.